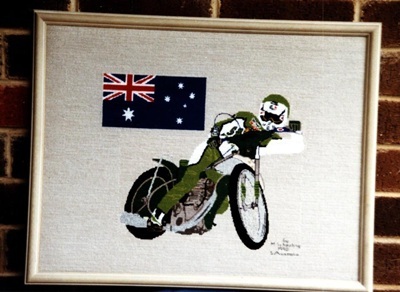 I have always made tapestries, but never tackled a speedway bike before. 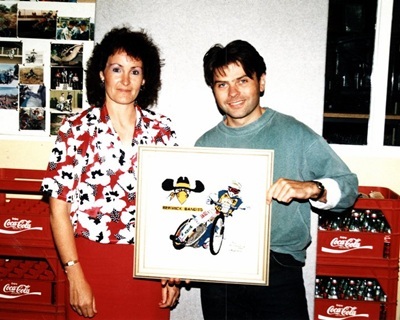 It all started with a bet, our Polish friend Wally bet I could not do a speedway bike. 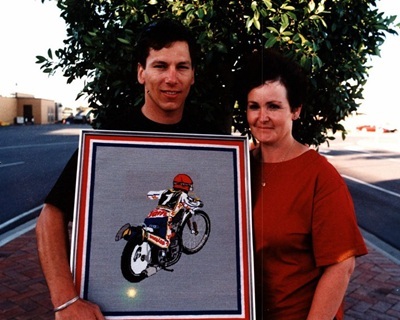 He was one of the starting marshals at our North Arm track, in Adelaide, South Australia. He was going over to Poland to visit family. I took up the bet and told him I would have a Sam Ermolenko tapestry finished by the time he came home in six weeks. He phoned me from the departure lounge to tell me to take my time, as it was going to be hanging on a wall a long time and he thought I needed to take my time. I started work on it straight away and did some work on it every night and at weekends. I thought I was inventive with all the chrome and decided to do all in silver thread, instead of plain grey or white effect, somehow in my mind it would not look right. I bought some silver thread made in West Germany from a haberdashery shop. All the stitching for the bike and rider is worked in Petite point stitch .The background is Bax stitch which is pure wool. Most of the other threads were from France. I based it on a photograph of Sam that my husband Dave (track photographer) had taken that summer. We had a selection of photos to chose from, but since Sam is so very good at doing wheelies we chose that one. I did complete the tapestry in 6 weeks, got it framed and when Wally returned home he was ecstatic. Then when Sam came over again, recovering from injuries sustained in a Long Track crash in Germany, I showed him it and said it was awesome. When the tour wound up in Adelaide, I presented Sam with the tapestry, to take home to England. I made a tapestry for Erik Gundersen to raise money for Pinderfields Hospital. When Billy Hamill gave the parcel to him he chose to keep it and he has it in his office back in Demark. The third tapestry was of Shane Parker. We have known Shane a long time and he was a crowd favourite at all the speedway tracks near us. He started at Sidewinders junior track in Adelaide and when he turned 16 progressed to our local senior track North Arm. He was always in all green colours & everything was green, green socks & undies - he even drank green cordial . A real entertainer & character that was for sure. After I had finished Erik's tapestry, I thought I would make one of Shane. The hardest thing to do on his was the Aussie flag, I redid it many times and nearly threw it out the window, with much frustration of sewing and unpicking it, time and time again. I persevered and got it right in the end. I never realized until I started sewing the flag, the union jack was going to be so difficult to sew. The lines on the union jack are different widths, never needed to take any notice until then, the design was intricate. With the canvas being lots of small squares, it was then it showed up. Lots of people look at it and think the engine or wheels were the hardest to do, when they first look into the detail of the stitches. I took my time in doing this one, no hurry. I had it framed and all finished now. Shane knew I was doing the tapestry and wanted always to see how I was going with it, but he did not get to see it or take it home until he got married. The fourth and final tapestry was of David Walsh. David had been out a couple of times to race our summer season. He was a nice lad and at the time was racing for the Berwick team. We saw a lot of him and got to know him quite well, we travelled the same tracks all summer and I decided one winter to start doing a tapestry of him. I had heard he was coming over, for maybe his last visit. Again I took my time and we had taken so many photos of him racing. I thought I would include the Berwick Bandits logo as he was still racing for them. Once it was all finished he was due to leave for England to go home and I travelled up to where he was staying and told him we had come to say cheerio. We had coffee and a chat and then I gave him the Tapestry all wrapped up, he unwrapped it and the look of amazement on his face was priceless, he did get a bit emotional and when he spoke, he said "why me?, I am not a world champion or anything special". But we thought he was, he was a great ambassador for English speedway. He then hugged and thanked me, some months later he sent me a thank you card, which I still have to this day. So, why tapestries and not paintings? I simply do not paint, but love tapestry. I have never done any more speedway bike ones. I am working on one of six race horses, an all action packed picture to the finish line. I started that some years ago. Broken shoulder, broken wrist and lots of shoulder/neck problems have hampered me finishing this one so far, but I will one day. 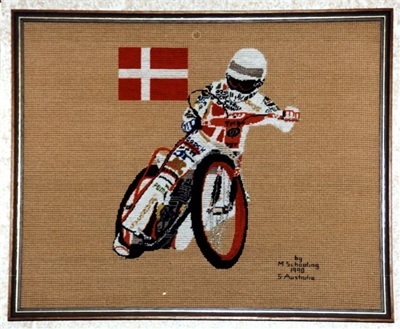 I have all my tapestries except the four speedway bikes one - Sam Ermolenko, Erik Gundersen, Shane Parker and David Walsh, I gave them as gifts to keep are hopefully they are with their trophies and other memories of their racing days.